Discover its soothing, penetrating action leaving an immediate feeling of freshness and comfort. Its exceptional regenerating effect stimulates cellular activity and reinforces the defence mechanisms of your skin. 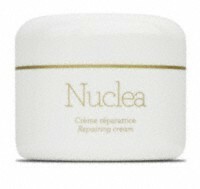 Nuclea is a light-texture repairing cream with exceptional regenerating properties. It dramatically reduces the depth of wrinkles and scars. Nuclea contains nutritional elements that are essential for cell division, cell growth and for the restoration of damaged or prematurely aged skins. It regularizes pigmentation or de-pigmentation problems arising from a chaotic melanin production. It is also ideal for sun-damaged skins. Nuclea has a healing and anti-inflammatory action. Use Nuclea in the evening over Synchro, in a very small quantity on the areas that need more regeneration such as wrinkles and scars.